Professor Victor Montori from the US Mayo Clinic was a main attraction to a lot of participants, when person-centered healthcare was debated on Tuesday 22 January from a Danish and American perspective, respectively, and focus was on both patients, staff, professional medical competency and the ‘system’. Associate Professor Maria Kristiansen shared her experience from being a close relative of a terminally ill child and explained how her research sheds a light on the importance of personal care, presence and intimacy. 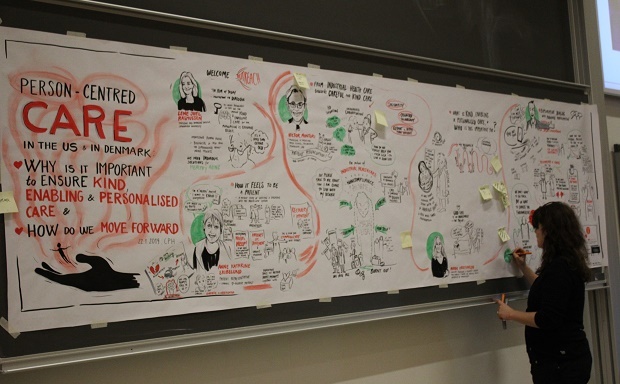 Associate Professor and Research Director Maria Kristiansen from the Center for Healthy Ageing and Department of Public Health had organised the innovative dialogue meeting between a number of stakeholders all interested in patient-centred treatment. The concept had been carefully thought out down to the smallest detail and signalled responsiveness, care and equality at all levels. According to Professor Victor M. Montori from the Mayo Clinic in the USA, person-centred treatment is the key to a strong and healthy healthcare system. The key speaker of the event, Professor of Medicine Victor Montori from the Mayo Clinic, researches evidence-based medicine and patient involvement. He has published more than 600 articles and is among the one per cent most quoted researchers in the world within clinical medicine. In 2017 he published the book ‘Why We Revolt: A Patient Revolution for Careful and Kind Care’, where he in short personal essays describe what he believes what he calls industrial healthcare does wrong and how it has stopped caring. ‘The seminar focusses on a complex topic – how and why the healthcare system should provide involvement- and care-based treatment to people in vulnerable situations. We have experienced overwhelming interest from a number of different actors, demonstrating the importance of the area’, says Associate Professor Maria Kristiansen from the Department of Public Health and the Center for Healthy Ageing. The participants were met by name tags without titles, which were meant to signal equality and to break with hierarchies. The same line of thinking was reflected in the programme; the first speaker of the day was Anne Kathrine Skibelund, heart patient and volunteer at the Danish Heart Foundation. She spoke about her own experiences as a patient and as a volunteer helping other patients. After Professor Victor Montoris account Maria Kristiansen shared her experience from being a close relative of a terminally ill child and how her research sheds a light on the importance of personal care, presence and intimacy. Using a digital dialogue tool, the participants wrote down questions, comments and suggestions for future research projects throughout the day, just as the main points of all presentations were illustrated graphically. The high number of participants from the healthcare system shows that the debate on personalised treatment is on a lot of people’s agenda and an important part of the future healthcare system. 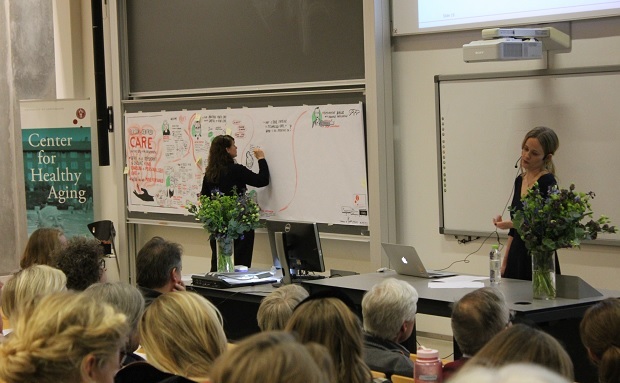 Both management, practitioners and clinicians from a number of hospitals in both the Capital Region of Denmark and Region Zealand participated in the event. Patients associations like the Danish Heart Foundation, the Danish Parkinson’s Foundation, the Danish Psoriasis Foundation and the Danish Society for Patient Safety were represented alongside the WHO, the Danish Cancer Society, the Danish Healthy Authority, the Steno Diabetes Center, the City of Copenhagen, the Novo Nordisk Foundation, care homes, Novo Nordisk A/S and other universities. ‘The concept is a strong example of a carefully thought out and thoroughly prepared outreach activity. At the Center for Healthy Ageing we have previously experimented with new meeting formats. In the future, we wish to organise more meetings between researchers, professionals and citizens, experimenting with the formats and putting people’s own experience into play for longer than the usual 10-minute Q&A session. I have no doubt that there is a great need for being able to discuss things face to face than usually seen at the university’, says Anéh Christina Hajdu, Head of Communication at SUND and Outreach Director at the Center for Healthy Ageing.